Many coin collectors start their hobby by collecting rare pennies. Pennies are generally easy to find and there are many variations to choose from. It's important to note that the word "penny" actually refers to a British coin; technically speaking, the American coin colloquially known as the penny should rightly be called a cent coin. But since most collectors refer to their treasures, American or British, as pennies, that term is often used interchangeable with cent. Throughout the history of the United States there have been some unique pennies. These are eagerly sought after by collectors. According to the University of Michigan, the penny has a fascinating history. 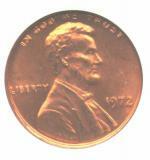 The first penny was made of pure copper and was issued in 1787. This penny is referred to as the Fugio cent. The name penny was derived from the British word, pence. It is believed that Paul Revere provided some of the copper that was used to mint the first rare pennies. The Indian head penny was introduced in 1859. On one side of the Indian head penny is a likeness of an Indian princess with full headdress. The reverse side states "one cent." These pennies were made until 1909. These rare pennies had a composition change in 1864 from pure copper, to 95 percent copper and 5 percent zinc. According to the U.S. Treasury, 1909 was the launch date for the Lincoln portrait penny. It was minted in celebration of the former president's birth date anniversary. Victor David Brenner was the sculptor selected by Theodore Roosevelt to create Lincoln's likeness on the coin. The Lincoln cent was also the first time the words "In God We Trust" appeared on the penny. The first minted Lincoln pennies had the sculptor's initials, VDB, stamped on the coin. Subsequent rare pennies did not have these initials, as some believed that it detracted from the design. In 1918 the initials were restored, placed slightly under Lincoln's shoulder. The steel cent made its appearance in 1943 as a result of World War II. The pennies were made of low-grade carbon steel and a zinc coating. These rare pennies were similar to the Lincoln head, with the exception they were approximately 8 grains lighter because of the lightweight metal. In 1944, the weight of the penny was changed back to the original 48 grains in weight when they modified the alloy being used in its composition. In 1959 the penny underwent another change on the reverse side. 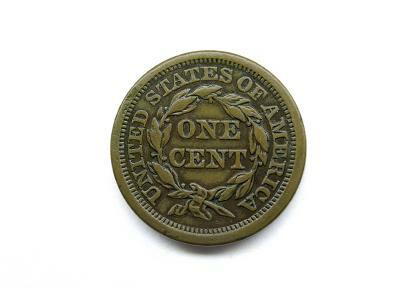 Until 1959, the words "one cent" appeared on the reverse, encircled by a two wheat heads. In 1959 the reverse was changed to the image of the Lincoln Memorial, located in Washington D.C. Frank Gasparro, an engraver at the U.S. Mint, created the design. His initials appear in the shrubbery around the memorial. 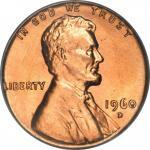 The 1960 penny is considered collectible for some simple changes that affected its design. Some pennies were minted with smaller dates than others; the smaller dates were found to be less common. 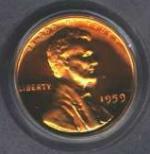 The value of the 1960-D penny rapidly increased in value, though quickly plummeted when the supply quickly met the demand. In 1970, a small date caused a ripple of interest in the penny, but nothing was as sensational as the 1972 double die error. On this particular penny, the date and motto were doubled. Many collectors have this particular penny in their collection, mainly because of the national attention given to this error. This was the first year that copper was no longer used in such a high percentage. The composition was changed from 95 percent copper and 5 percent zinc to 97.5 percent zinc and 2.5 percent copper. The reason for this huge change was the rising cost of copper. The double die errors have continued, with the most recent example being the 1995 errors. With so many of these pennies in circulation, it isn't unusual to come across them in the course of regular transactions at your favorite stores or at the bank. While it isn't probable that you could find a Fugio penny by accident today, it is still possible to come across Indian head and on occasion, steel pennies. The trick is keeping your eyes peeled for these finds as well as looking for your favorites in the right places. There are several places you kind find rare pennies on the Internet. Heritage Auctions carries a wide variety of collectible coins including unique and rare pennies. 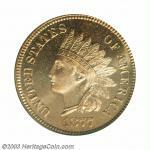 David Lawrence stocks many rare coins, both American and from around the world. The David Hall site is full of information and resources about collectible coins. It includes a price guide and coins for sale. Pete's Collectibles specialized in United States coinage that is certified. The company has been in business since 1986. Collecting rare pennies is a treasure hunt of sorts. They can be found anywhere; a sidewalk, in a cash register, in jar of pennies. Most people never consider examining the penny they are about to use at the store to see if it might be rare. Once you start looking, you may be surprised how many you find. One thing is certain, however; you will never look at pennies the same way again.